New gathering place on campus outside the Sciences and Technology Building has food service and picnic tables with solar powered stations to recharge electronic devices. New gathering place on UH Hilo campus outside the Sciences and Technology Building has food service and picnic tables with solar powered stations to recharge electronic devices. Jan. 19, 2018. A new area for students to eat, talk story, and recharge their electronic devices is now open outside the Sciences and Technology Building at the University of Hawai‘i at Hilo. The new gathering place has several picnic tables, each with a solar charging station, a new food vendor to the campus serving authentic Mexican cuisine, and 15-minute parking spaces. The charging stations found on the tables include one 110V outlet for laptops and two USB ports for cell phones. Each charging station has one 110V outlet for laptops and two USB ports for cell phones. Each station has a 30-minute timer to conserve solar energy stored in batteries when not in use. Timers can be re-activated in 30-minute intervals as needed. The prototype uses one solar panel and battery storage, which can be easily expanded in the future if demand for solar energy to use electronic devices exceeds current capacity. 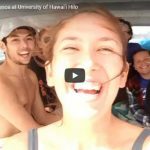 The project—in sync with UH Hilo’s strategic plan and supported by Interim Chancellor Marcia Sakai and Interim Vice Chancellor for Administrative Affairs Kalei Rapoza—is part of two larger long-term initiatives underway at UH Hilo: 1) to create comfortable spaces for students to gather and recharge themselves and their tech devices, and 2) to make the campus more sustainable in its energy use. Three classrooms transformed into 21st Century Facilities in pilot project at UH Hilo (Aug. 23, 2017, UH Hilo Stories). Trend-on: UH Hilo’s main dining room is transforming into a cozy, modern eatery (Jan. 6, 2017, UH Hilo Stories). 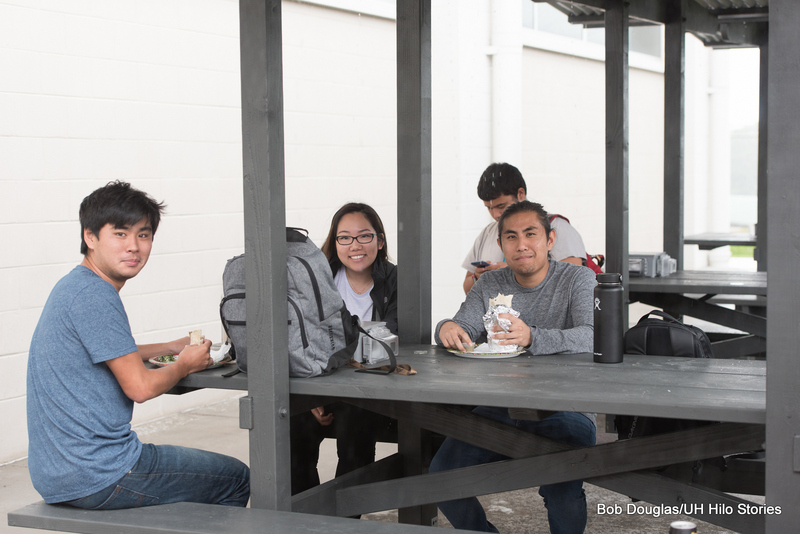 Students having lunch on one of the new tables outside the Sciences and Technology Building. Jan. 19, 2018. 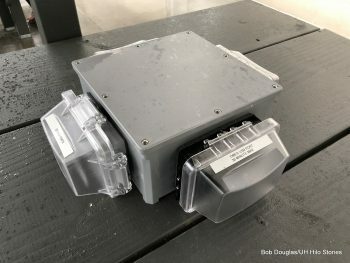 The new solar charging stations—picnic tables with overhead solar panels and ports for charging electronic devices—were built through a collaborative process between UH Hilo and Hawai‘i Community College. 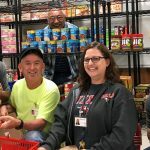 “Lots of really great people collaborated on this project,” says Brenda Hamane, director of special projects at the UH Hilo Office of Administrative Affairs. 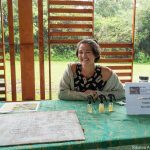 Last fall, UH Hilo information technologist Dave “Moku” Baptiste proposed the idea of a solar-powered gathering place, having been inspired by similar projects at other universities. But the total cost to purchase, deliver and install a four-seat solar panel picnic table charging station originating from the mainland was estimated at $18,000 per table. With some creative thinking and collaborative efforts, the cost to produce comparable stations (with six to eight seats) was brought down significantly to approximately $2,000 each. First, Baptiste suggested building a prototype picnic table using leftover solar panels from a prior construction project. 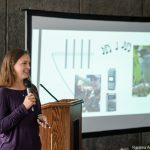 He then collaborated with Darryl Vierra, Hawai‘i CC carpentry program instructor, and recently retired director of auxiliary services Kolin Kettleson on a picnic table design capable of supporting an overhead solar panel to charge electronic devices. This collaboration resulted in the creation of a prototype that seats a total of eight people or six people and space for a wheelchair to provide accessibility for all students. 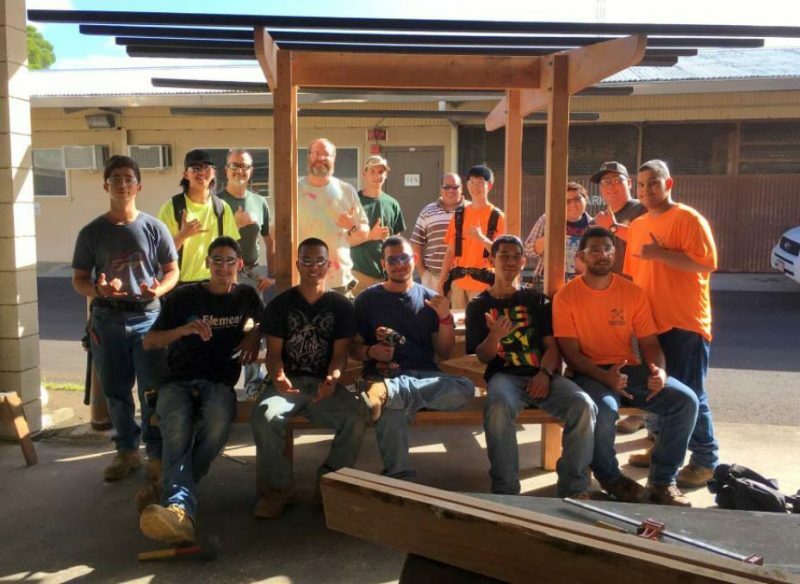 A total of four tables were constructed as part of Hawai‘i CC’s carpentry program curriculum—13 Hawai‘i CC carpentry students under the direction of Vierra completed the tables in three days. The Hawai‘i Community College student work crew that built the tables with instructors and UH Hilo staff. Front row (l-r) Maika Robertson, Reymart Villanueva, Jordan Mays, Dustin Pacheco-Sakoda, and John Rios. Back row (l-r) Dylan Chaves, Macyn Kanaeholo, Darryl Vierra, David Marquis, Christopher Correa, Moku Baptiste, Jayke Sakai, Akemi Kaneshiro, Garyn Hoota, and Jeremy Mays. Photo courtesy of the Office of Administrative Affairs. Following the construction of the tables, Baptiste, Darrell Miyashiro, a technology instructor from the machine, welding and industrial mechanics (MWIM) technologies program at the community college, and student worker Kye Harford, painted the tables, welded gutters to the tables, and installed the battery storage units. 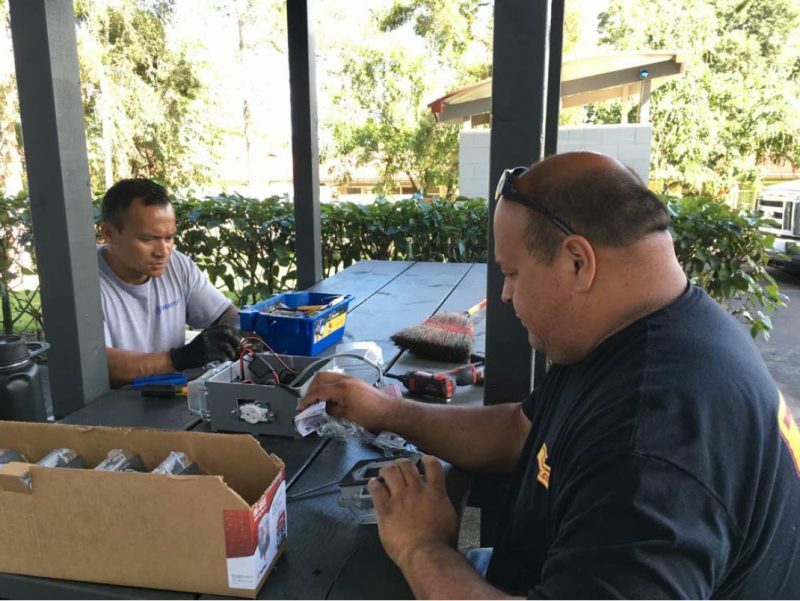 UH Hilo electrician Shannon Asejo (left) and information technologist Moku Baptiste working to install recharging system. The two specialists installed the solar panels, timers and controls to activate the outlet and USB ports for electronic devices. Photo courtesy of the Office of Administrative Affairs. UH Hilo Auxiliary Services personnel pitched in under the direction of Calvin Fukuhara, building maintenance supervisor, to transport the tables to campus, relocate bike racks and anchor the four tables to the concrete pavement. The total cost to construct four eight-seat tables turned out to be less than half the cost to purchase and deliver one table from mainland manufacturers at the $18,000 estimate. Hamane says this cost effective project could not have been accomplished without the collaboration between Baptiste, Vierra, carpentry students, Fukuhara, and the team effort of the auxiliary services crew. In addition to the tables with solar charging stations, the new gathering place outside the Science and Technology Building also includes a new food concession trailer. Pancho’s Tacos is serving authentic Mexican cuisine at affordable prices. 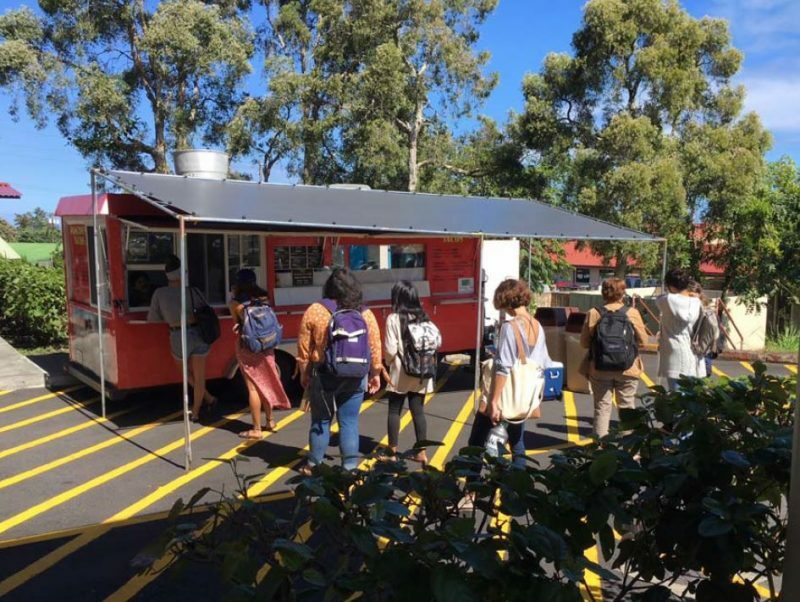 Students line up to order food at the new Pancho’s Tacos food truck on campus. Photo courtesy of the Office of Administrative Affairs. 15-minute parking is available near the food truck. Photo courtesy of the Office of Administrative Affairs. Students can purchase a satisfying meal for $5 or less with choices including tacos, burritos, quesadilla, tamales, torta (mexican sandwich) or breakfast burritos. In the coming months, Pancho’s Tacos will also serve affordable daily specials of fish tacos, chili and beans, ceviche and gorditas. 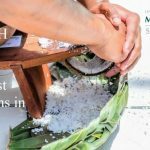 New food vendor at the UH Hilo Sciences and Technology building (Jan.18, 2018, UH Hilo Stories). 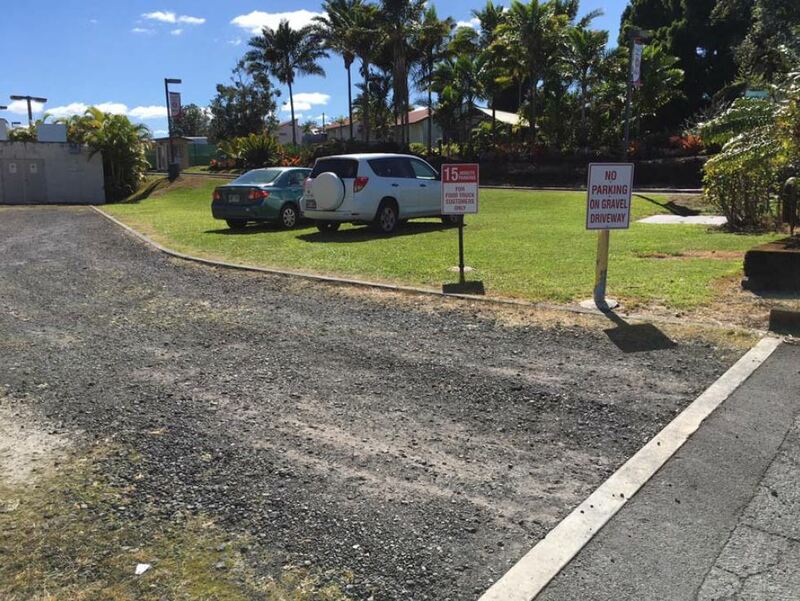 Brian Hill, construction manager at UH Hilo, assisted with the food concession trailer coordination requirements. 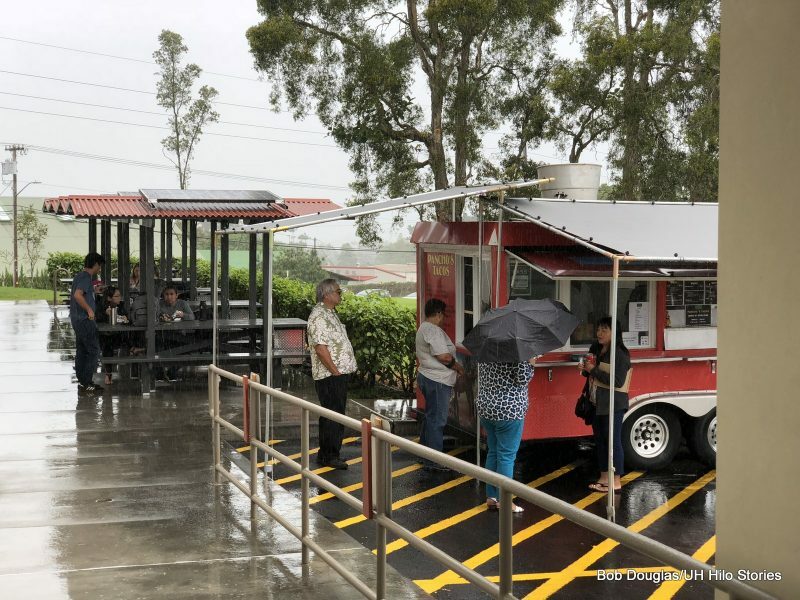 Hamane says if this type of gathering place with solar charging stations and good food are well received by students, UH Hilo administrators will move forward to work with Hawai‘i Community College to create more, adding to the growing list of renewable energy projects happening on campus.